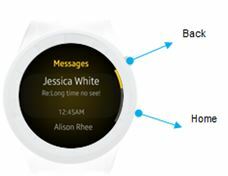 Device buttons help you quickly switch between the watch and other functions. What are the functions of the back key? What are the functions of the Home Key? ●Press : Open the Apps screen when you are on the Watch screen. Press and hold for more than 7 seconds to restart.